No I have not dropped off the planet…again. I was away visiting family and since returning home I have been inundated with prenatal appointments for baby #2. On top of that I been posting like mad to my Etsy shop uploaded a whole bunch of fun and colorful jewelry. So yes I’ve been working on jewelry, no I haven’t been working on much Art. That’s primarily because I have 3 Jewelry related events coming up in November that I’m working away at getting inventory stocked up for. “Something Special Craft and Gift Sale” held at the Fort Saskatchewan Legion in the Normandy Room. Is the “4th Annual Christmas in the Country” held in St. Michael, St. Michael Rec Centre. I will be at Booth #49 as soon as you walk in the doors! If you plan on attending this event, I have a special Christmas treat for you. I plan on having tons of goodies in stock for these events including pretty much everything you see on my Etsy site for Jewelry as well as some lovely hand painted bracelets, bookmarks and pendants, sure to be one of a kind. Hope to see tons of you out to these wonderful events! 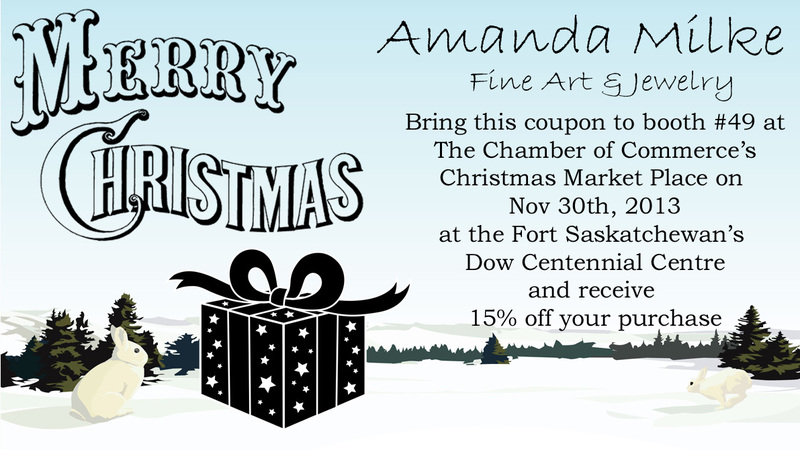 This entry was posted in 2013 Artwork, Art, Art Events, Artist, Birth, canada, Christmas, Etsy Shop, events, female artist, For Sale, Home Studio, Jewelry, Life, Pregnancy, Uncategorized on October 9, 2013 by Amanda.